I had the great fun of being interviewed for the Write Now! podcast hosted by Kitty Bucholtz. 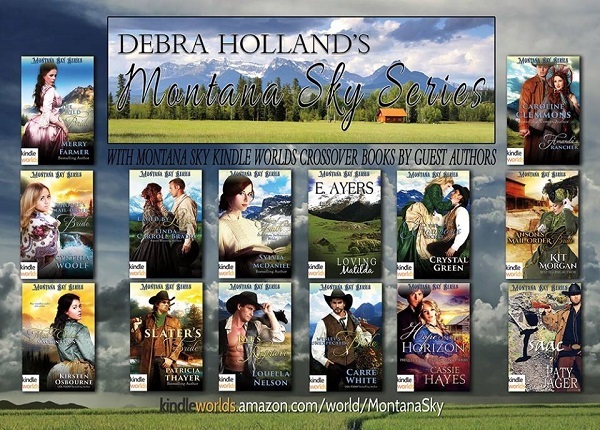 The topic was my 7-title series, Entertainers of the West, written within Debra Holland’s Montana Sky Kindle World. I talked about how I first got involved and then a bit about how I picked the plots. Kitty also did an interview with Debra who shared about the process of how the kindle world came into being. Both interviews are about 30 minutes in length. Two more authors, Kristy Phillips and Louella Nelson, are scheduled to be interviewed in subsequent weeks. The interview can also be found on youtube by looking up Write Now! Workshop. Injured ballerina Savina Lombard seeks refuge on her cousin’s ranch outside Morgan’s Crossing, Montana Territory until her foot heals. A dashing horse breeder/trainer arrives for his annual summer visit. Estefan del Vado comes from a family who raised championship trotters and his goal is to prove to his father the value of his cross-breeds. To accomplish that, he needs to win one of the season’s pacer harness races. On the Rolling M Ranch to train, he’s distracted by the delicate beauty who is determined that trick riding will be her new career. Using her dancing skills atop galloping horses is sure to win her a spot in Buffalo Bill’s Wild West exhibition. For a few glorious weeks, they share an enjoyment of the horses and getting acquainted. But when the time comes to pursue their separate goals, Savina and Estefan are split apart, geographically and emotionally. How will they discover a path they both can walk? 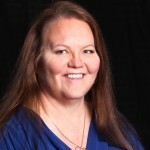 The third book written in Debra Holland’s Montana Sky story world has just released. 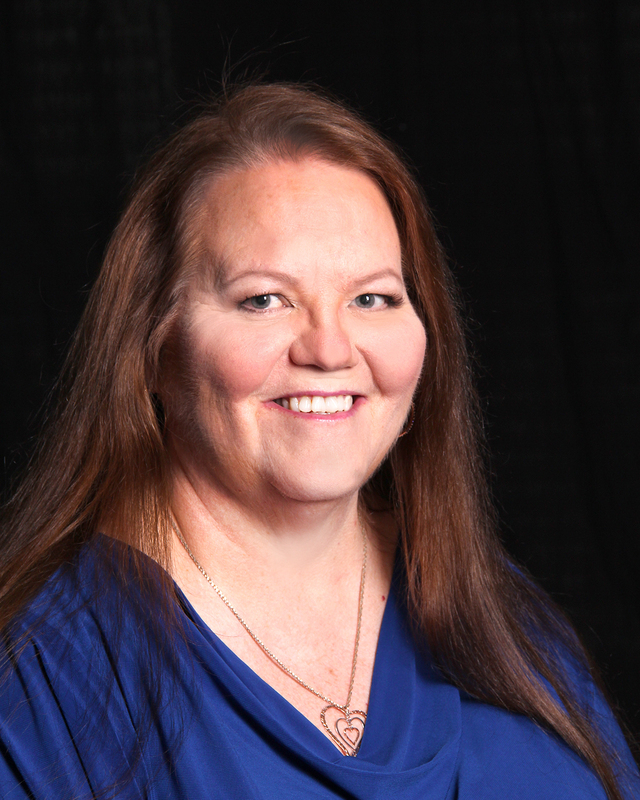 Dance Toward the Light features the third vaudeville performer, Dorrie Sullivan. She was introduced in the first book as being a friend of the two York sisters when the troupe arrived in Morgan’s Crossing. Well, in books 1 and 2 Cinnia and Nola have found romance and happiness. The Great Blizzard of 1886 is over, the snows have receded, and Dorrie is unsure of what her future involves. Enter Valerik Andrusha who barely survived the blizzard and traveled from the Canadian wilds to visit brother Nicolai in Morgan’s Crossing. But Nicolai has taken his bride, Cinnia, to San Francisco to meet his parents. Normally reclusive, Valerik figures he’ll get much needed rest and relaxation while he waits his brother’s return. Almost against his will, he is captivated by the vivacious woman living in the attached shop who draws him into the community. What does a man who prefers the shadows have in common with a woman who loves the light? 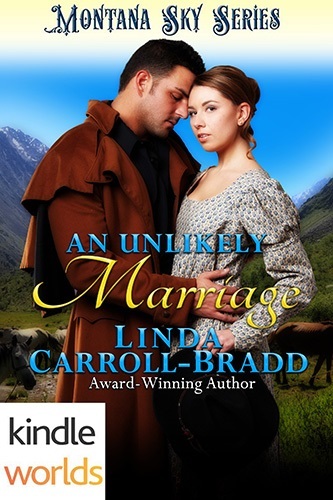 An Unlikely Marriage is a Montana Sky Kindle Worlds novella that stars characters Torin Quaid and Nola York who played a secondary role in the first story. Laced By Love, is still on sale for 99 cents and is on the best selling western romance list. BLURB: Helping injured cowboy Torin Quaid drive mustangs north provides a way for vaudevillian Nola York to earn a train ticket east—and get one step closer to her goal of auditioning for Buffalo Bill’s Wild West stage production. The temporary marriage is solely for propriety’s sake. Until disaster strikes, and the two must rely on each other—emotionally and physically—to safely reach Torin’s ranch. Will a marriage of convenience turn into more on a trail drive through Montana Territory? She complied and, between the two of them, the eight- or nine-inch piece was cut free. Nola shot him a narrowed-eyed look before she stripped off her gloves and picked at the end of the strand, pulling a strip loose. Maybe his voice wasn’t as calm as he’d thought. He crossed his right arm under his left to support the wrist. “Huh.” Her nose crinkled as she concentrated on peeling the rope. Needing to feel like he contributed to this repair, he dug out the chain loop from his pocket and held it up. For a moment, her hazel eyes widened and she sucked in a breath. Returning her concentration to her task, she went silent. Being terse toward your new bride on the first full day of your marriage was probably not the wisest act. Torin slipped his good hand into his back pocket and walked a few paces away, tipping up his head to study the wintery sky. Grayish-white clouds bunched together like tufts of cotton formed a puffy bank toward the north. He needed to keep an eye out in case they grew any darker. Lena DuBois never knew her father until he suddenly reappeared in her life to tell her he’s arranged for her to marry one of his business partners. Lena flees, deciding to become a mail-order bride, where at least she’s the one doing the choosing. Her future husband, John Thorpe, has requested a woman of good moral character which Lena considers herself to be. The problem is her mother is the most celebrated madam in all New Orleans. What will happen if he discovers her secret? He paused and took a deep breath. He turned his hat over and over on his lap. She couldn’t believe his arrogance and she didn’t need a stranger’s help in securing a husband. She would remain calm, just like she did when the children she taught were getting rambunctious. “My name is Lena and I refuse to be dictated to by a stranger. Please leave.” She pulled the cord for Thaddeus. “I’ll leave now, Helena,” Robert donned his hat. “But I’ll be back in two weeks and I expect you to be ready to come with me to New York. Lena shook all over. Never would she marry some man her mother, or her newly discovered father, had chosen for her. Her mother had tried before to get her to marry. Lena was shamed by Mellisande’s business and might hate herself sometimes because of that shame, but she hadn’t fallen so far that she would allow her mother to choose a husband for her. She hadn’t before when Mellisande wanted her to why would her mother think that she would now? How could they tell her all of this at once and expect her to acquiesce to their demand? First she had a father, and second, she was supposed to marry some strange man, not of her choosing. That had been the problem last time. She hadn’t chosen the man. Her mother had. This was no different and she would not stand for it. She dropped into one of the large overstuffed chairs in front of the empty fireplace, making sure it was not the one her father had sat in. Grabbing the paper from the coffee table she flipped through the pages looking for a special advertisement. One she’d heard whispered about by her teacher friends at school when they wanted to marry. Finally she found it and read to remind herself of the details. Women wanted. Matchmaker & Co in Golden, Colorado is recruiting women with the object of marriage to one of their thoroughly screened bachelors. These men are farmers, ranchers, miners and of other occupations, that are desirous of marriage and family. Contact Mrs. Maggie Black, with your photograph and the type of man you are looking for. This was perfect. She could choose a husband far away from both New York and New Orleans. Her parents would never find her and she’d finally lead her own life as she saw fit. Cynthia Woolf is the author of twenty historical western romance books with more books on the way–as Cynthia loves writing and reading romance. Her first book, Tame A Wild Heart, was inspired by the story her mother told her of meeting Cynthia’s father on a ranch in Creede, Colorado. More information is at her website. I’ve been writing romantic fiction full time since 1994 but only sold my first novel in 1998, a contemporary western titled Be My Guest to Kensington. Since then, I’ve written numerous contemporary and historical western romances. Since 2011, I’ve been a self-published author and love the control (plus I make far more money on my own than I did with a publisher). First I see characters, which are engaged in some scene in the story—usually the inciting incident. The plot comes from there. I write with classical music. I do email with light rock, swing, or jazz—depending on my mood at the time. I prefer to do my research first and save it to the book’s folder. That helps me plan the plot. If something else crops up, I research at the time. Most. My latest two are set in Montana and Washington state, and I’ve never been either place. I relied on extensive research and advice from people who have been there. Most of my books are set in Texas, which is where I live. I’ve been to all of the settings in those books. I have written several contemporary western romances and will have more releasing in 2016. I’ve written a couple of mysteries but probably won’t do more. A month in Ireland. After two trips there, my husband and I decided that IF we return, we’ll rent a cottage and spend a month touring at our leisure. We also enjoy England, Scotland, Switzerland, and southern Germany, but our favorite is Ireland. I use a storyboard. Years ago my plotting group heard Laura Baker and Robin Perini present their “Story Magic” plotting method. I imagine there was a light bulb flashing on over my head during the workshop. The method made so much sense to me and helped me overcome many of my plotting problems. Yet, a few who heard that presentation didn’t find it helpful. We’re all different, aren’t we? Telling you what I don’t read is easier. I never read true crime, horror, zombies, or much sci-fi. I especially enjoy western historical and western contemporary, women’s fiction, and WWII mysteries such as those by Leeann Harris and Susan Elia Macneal, and British mysteries and Regency. If writing a historical, I use names from my family genealogy. If writing contemporary, I Google names popular twenty-five to thirty years ago. Names are important and require the right sound. For instance, hard consonants make a hero sound stronger. For a historical heroine, I prefer an unusual name or after someone in my family or both—as in Parmelia in Long Way Home. Sometimes a heroine’s name can be a contrast to her personality. My husband and I have one dog and three cats, all rescues. Our little Shih Tzu is almost blind and is hard of hearing now, so he is not adventurous and doesn’t play as he used to do. Our cats are each very different. Sebastian is a huge tuxedo who lets only me pet him and usually sleeps beside me. Max is a Manx and always into mischief. Jasmine is a rag doll that is a shy, sweet, cuddly cat. I hope they reach the end of the book with a happy sigh for the pleasant experience, a temporary escape from their problems, and entertainment. Growing up in a brothel, Mara O’Sullivan battled public disdain and contempt, but always remained kind-hearted and gracious. After testifying against vicious bank robbers, her life is threatened and Mara must find sanctuary far from everything she knows. One train ride changes her life as she fatefully meets a half-sister and a niece she never knew existed. 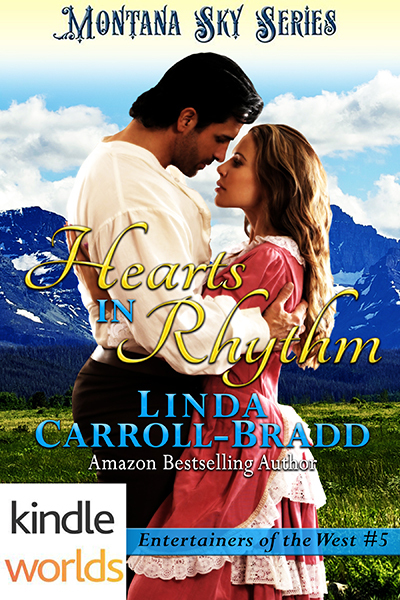 But when circumstances end her sister’s life, Mara makes a promise that she’ll raise her niece as her own and take her sister’s place as Preston Kincaid’s mail-order-bride. As Mara and Preston grow closer, their marriage no longer seems like a ruse, but a relationship of love, passion, and desire. Mara’s past comes back to haunt her and she finds herself in danger—will her new husband forgive Mara’s deceit and protect her as his own? They reached the church and Preston jumped down from the wagon and came around to help her alight. With a smile, he lifted Iris high over his head before he set her on the ground. Her giggle brought tears to Amanda’s eyes. That was the first time she’d ever heard her daughter make the girlish sound. 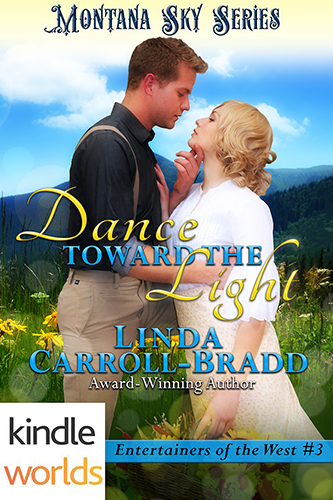 Iris had smiled, spoken, but never laughed until she met Preston Kincaid. For that alone, Amanda would be the best wife she knew how to be. Inside the church, Mrs. Norton handed Amanda a bouquet of daisies secured with a white ribbon. The interior was plain with wooden benches and an altar raised one step above the rest of the floor. Although there were several windows, none had stained-glass as did the churches she’d seen in Georgia. The minister was waiting at the front of the church and wore a black frock coat and matching string tie. His brown hair and beard were thickly streaked with gray. He stood at a simple lectern with what looked like a Bible in one hand while he conversed with another man. Amanda was surprised only one other person besides Reverend and Mrs. Norton were in the sanctuary. She’d supposed Preston had many friends in the area and thought at least his ranch hands would attend. The second man turned and proved to be an older version of her groom who came forward to greet her. “Would you? I’d be ever so grateful.” She laid her hand on his arm. Nerves had set in and she needed his support or her knees might give way. Sympathy shone from his blue eyes. “Of course.” He took Iris’ hand in his and strode to the front. Mrs. Norton began playing the piano. She nodded toward Amanda. Papa Kincaid gently led her up the aisle. Walking toward her husband, Amanda was conscious of Preston’s stare, as if he could see into her mind and knew her for an impostor. Although he held Iris’ hand, the intensity of his blue gaze unnerved her. She wondered if he was disappointed or if he were as numb as she. Thankful for the presence of her future father-in-law beside her, she tightened her hold on Mr. Kincaid’s arm. Iris gave a tiny wave and Amanda couldn’t resist smiling at the child. The little girl truly was a blessing. Focusing on Iris gave Amanda a target she could face. Iris looked at him adoringly and reached to receive the flowers. Reverend Norton opened his Bible and began the ceremony. Preston took Amanda’s hands in his. She was conscious of his calluses, but also of the size and strength of his palms dwarfing hers. When the minister indicated, Preston slipped a ring onto her finger. This new one belongs to me, even if my groom doesn’t know my true name. After the ceremony, Preston brushed his lips gently against hers. He smiled broadly. “I certainly am.” He leaned forward and gave her a loud smack on the cheek. The child giggled. Twice in one day this kind man had made Iris happy. Amanda owed Preston all her wifely devotion. Caroline is gifting an ebook of the winner’s choice.Name to be selected from those who leave a comment. Caroline and her husband live in the heart of Texas cowboy country with their menagerie of rescued pets. When she’s not indulging her passion for writing, Caroline enjoys family, reading, travel, antiquing, genealogy, and getting together with friends. Find her on her blog, website, Facebook, Twitter, Goodreads, Google+, WattPad, Shelfari, and Pinterest. Subscribe to her newsletter here to receive a FREE novella of Happy Is The Bride.